Materials: Muslin Fabric Selvage Strips, Muslin Fabric, Selvage Strips From Cotton Plaid, Zippers. Description: Rows and Rows of Shrunken, Frayed and Fringed Muslin Selvage Strips and Selvage Strips from a Grey Blue and Khaki Mini Plaid Fabric Have Been Appliqued to a Muslin Backing to Create a Pair of Chenille Pillow Covers. 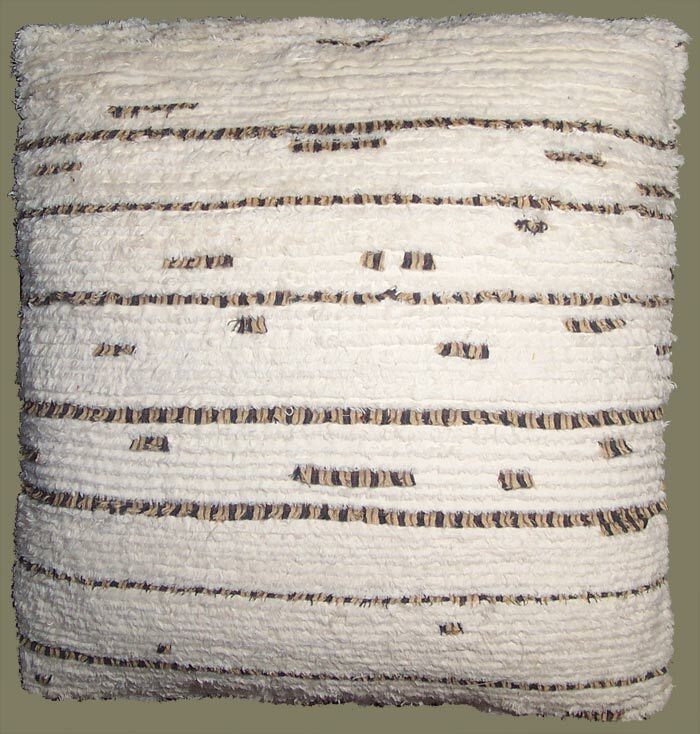 This Soft and Cozy, Very Eco Friendly Chenille Comprises Both the Fronts as well as the Backs of Each Throw Pillow. Made of Remnant Cotton Fabric Strips, and Wonderfully Plush and Soft. Natural Muslin Off White Color. Easy Care: Hand Wash / Toss in Clothes Dryer on Medium. Great Home Interior Dressings for That Cozy Cottage, Cabin or Country Home Interior. Pillow Covers So Appropriate with American Country Furnishings, Collectible Hooked, Rag, and Braided Rugs, Patchwork Quilts and Folk Art.